"How would Socrates and Plato react to a modern world where secularism and religious fundamentalism are growing while the gap between the human mind and animal mind is narrowing? Using some creative license mixed with real history, science, and philosophy, Seeking Perfection addresses that question. Matt J. Rossano uses a narrative/dialogue format to superimpose on modern times ancient Greece's two most eminent philosophers, along with its government and culture.The story begins with Plato's daring escape from Sicily, where he tutored Dionysius II in philosophy. On board his homebound ship, Plato recounts his experiences in Sicily. 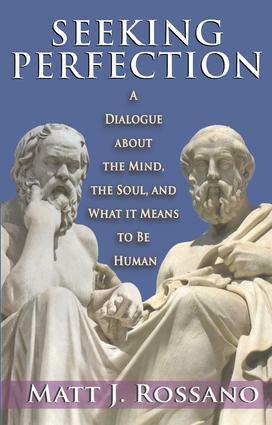 In this narrative, the intellectual difference between practical rewards and the pursuit of ideals provides the basis for a series of dialogue on science, secularism, religion, and the uniqueness of the human mind.Upon the ship's arrival home, Plato's mentor, Socrates, is arrested and his trial provides the venue for the book's final dialogue. The final dialogue serves as a counterweight to the earlier ones. Rossano begins and ends with a philosopher imprisoned by his views, indicative of one of its main messages: the true philosopher uses a well-disciplined mind and the best knowledge of the day to get as close to the truth as possible. In doing so, he invariably gets into trouble. This imaginatively constructed tale will absorb those interested in what the philosophical masters might say about today's world."